Majority In Congress Are Millionaires : It's All Politics An analysis by the Center for Responsive Politics found there wasn't much distinction between the two parties: Democrats had a median net worth of $1.04 million as compared to about $1 million for Republicans. In both cases, the averages are up from last year, when the numbers were $990,000 and $907,000, respectively. 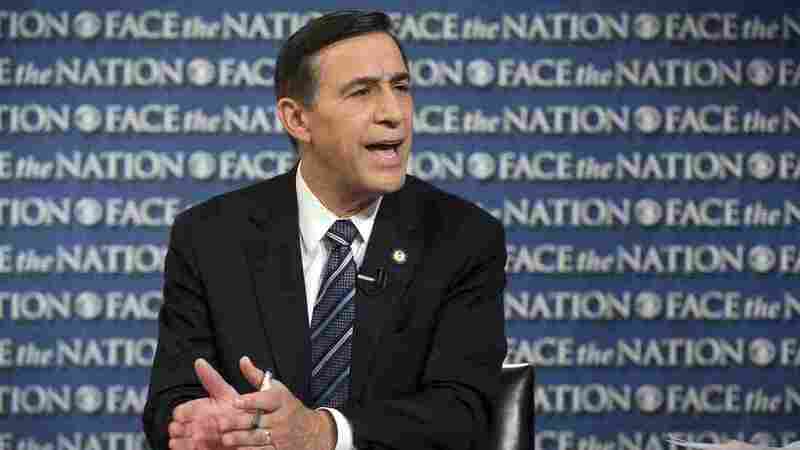 Rep. Darrell Issa, R-Calif., speaks on CBS's Face the Nation in Washington on Oct. 27. A new report lists Issa as the wealthiest member of Congress. For the first time in history, more than half the members of Congress are millionaires, according to a new analysis of financial disclosure reports conducted by the non-partisan Center for Responsive Politics. Of the 534 current members of the House and Senate, 268 had an average net worth of $1 million or more in 2012 – up from 257 members in 2011. The median net worth for members of the House and Senate was $1,008,767. The wealthiest member of Congress? That's Rep. Darrell Issa, a California Republican, who had a net worth between $330 and $598 million. The reports found that there wasn't much distinction between the two parties – congressional Democrats had a median net worth of $1.04 million as compared to about $1 million for Republicans. In both cases, the averages are up from last year, when the numbers were $990,000 and $907,000, respectively. The release of this analysis comes at a time when officials in both parties are making an effort to address income inequality in the United States.